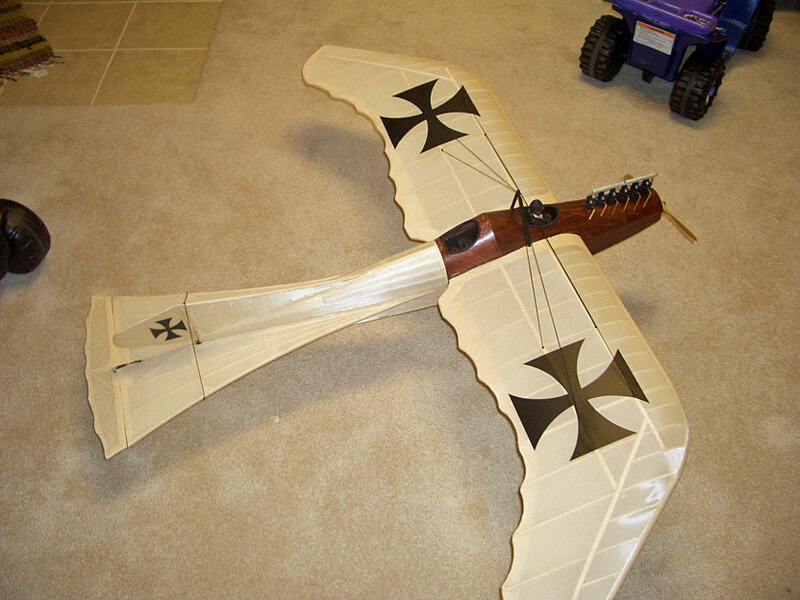 I just scratch built the FT Spitfire from plans on this site. What a great flyer! The guys at La Vista field this Sunday at the fun fly asked me to get in touch with you to post a link and some comments on the web site. Josh Bixler and crew are designing all the time, and now have 10 planes in the Swappable Series. The Spitfire is just the latest in the series, and I couldn't wait to jump into one. They're built from Dollar Tree foam board with a common power pod. This means you can transfer your motor, ESC, RX and battery from model to model. It's cheap, easy and fun! 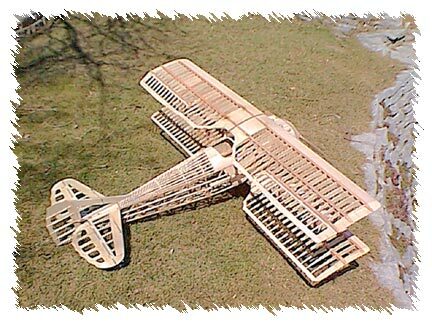 Many of the plans can be built from one or two sheets of foam board, hot glue, a few barbecue skewers and some 3/32" ply. 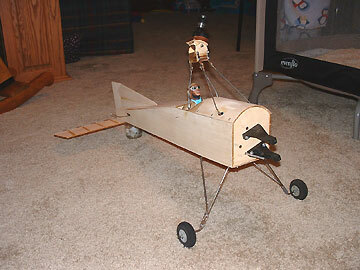 I built my Spitfire in two evenings using spare electronics I just had laying around. I did splurge on a $15 motor and a new RX. It looks like Joe really outdone himself with this one. Very nice looking plane. Here's a link to more Taube pictures that Joe sent. First of all I would like to say that I think Dave's project is just great. 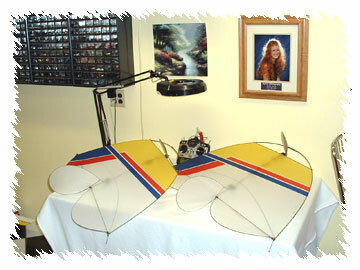 I am very interested in building small scale twin engine indoor electric airplanes. 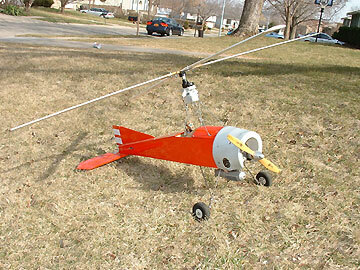 The twin is made from parts from the Cessna 210, 18 gram plane that is now so popular. 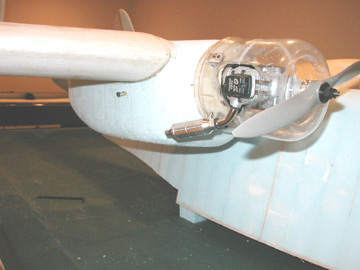 The nacelles where made from scratch and the fuselage was modified from the high wing 210. The wing is the same wing that is on the 210. Dave has posted some pictures on R/C Groups. Take a look and see if you too don't think this is a great kit bashing project!. Here is a link to the pictures. Video Of Dean's 2nd N9MB Northrop Flying Wing "Taxi Tests"
Video Of Dean's 2nd N9MB Northrop Flying Wing "First Flight"
The video I made of Dean Copeland's first flight with the Northrop N9M Flying Wing can be seen on Google Video now. Go here: Video Of Dean's 2nd N9MB Northrop Flying Wing "First Flight" The video runs for about 5 minutes. 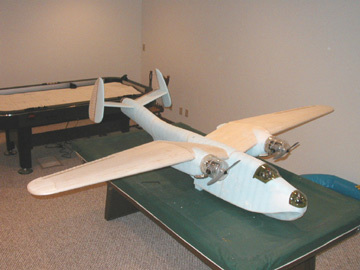 Specs: 1/6th scale with 120" wingspan; weight 24 lbs. ; twin electric motors powered by 23v batteries at 10 amps producing approximately 890 watts of power each; full retracts and flaps. The flight was at the Wahoo Airport (20 miles west of Omaha) on Monday 23rd of April. 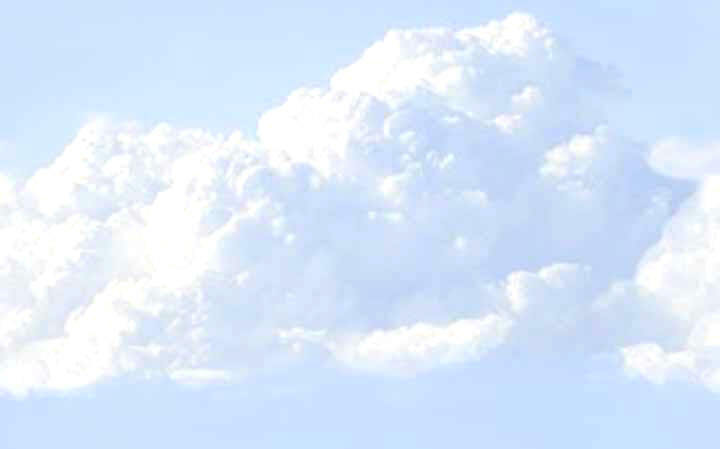 Weather conditions were good with temp in the low 60s and winds at or under 8. After a thorough pre-flight, Dean taxied the Wing to one end of the taxiway and pointed it into the wind. A smooth 200 ft roll and the Wing lifted gently into the air and flew for six minutes. It tracked real well in the turns and was steady. The video shows preparation for the flight and the takeoff as well as a short clip of the actual flight. The camera guy (...that be me...) had problems finding the Wing in the sky through the video camera's viewfinder. Of course, the Wing has a low visual profile that didn't help me. Dean leaves Saturday for Top Gun that will be held next week near Orlando, Florida. Wish him luck. 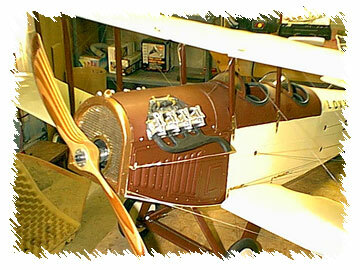 Ed Splittgerber's New 1/5 Scale Waco YMF-3 Project. 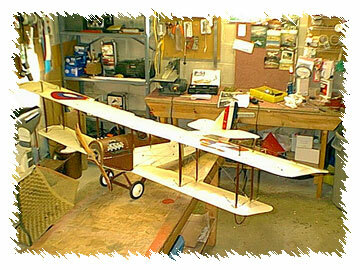 Ed's building project is a WACO 1/5th Scale YMF-3. 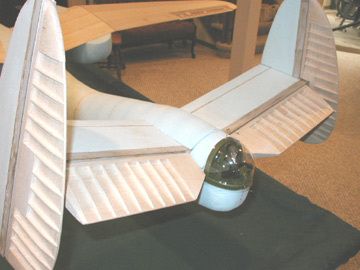 This is a scale model of an open cockpit biplane built in the mid-1930’s. Ed is building it from an old PICA kit that was sold in the mid '90s. 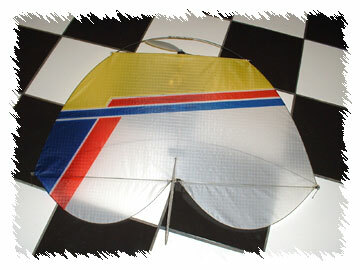 PICA went out of business a couple of years ago and was recently purchased by Cox Hobbies. However, kits are not yet available from them. 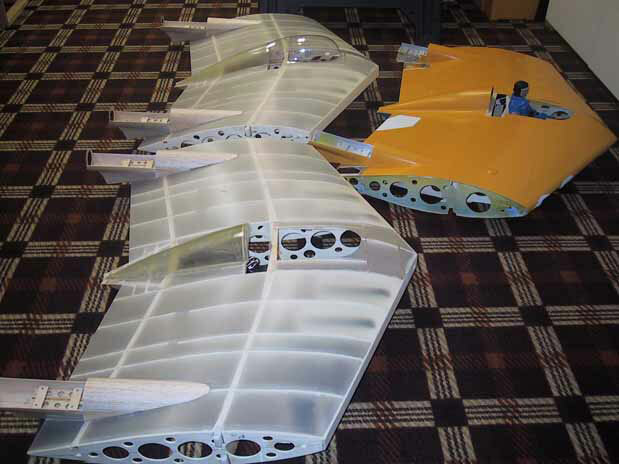 I have attached some in progress pictures of the wing; first one is of the 33 inch center sections (original and the two new ones). 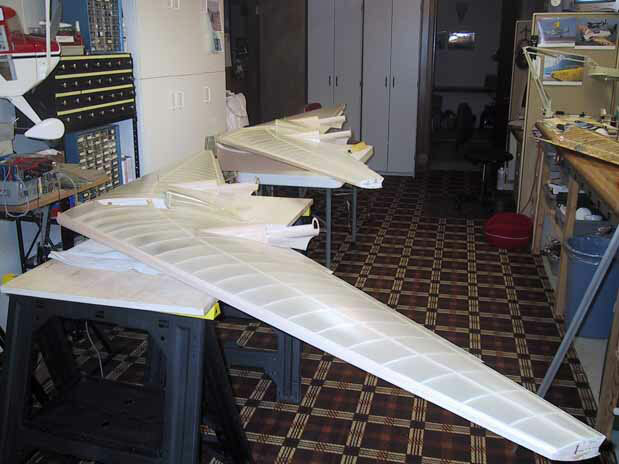 Second and third photos are both wings assembled; looks like Northrop’s assembly line, each have a ten foot wing span. Not much room in the shop when they are together but wanted to see what it looks like with the two put together. The reason they are both assembled is that every thing I do to one I do to the second one right away and this step required assembly. Both planes are at the same point of construction at all times. I have them numbered 1 & 2 (1 being the primary one and 2 the back up). I always do the next step on the #2 plane and then on the #1 plane, this should make the #1 plane the better of the two but #2 is turning out to be equal. Things are going well and the new ones are much more precise than original with lots of improvements. One improvement is the turtle decks, nacelles and belly pans are fiberglass (this required plugs and molds; lots of work but worth it). I am approx. 3 months ahead of the project as compared to last year when I was only building one; I have been reverse engineering the first one which has saved lots of time since all the time consuming design has been done. With a little luck and a back up I should have one for the 2007 Top Gun. (I received my invitation a couple week ago). Top Gun is May 2 thru the 5th, 2007. Joyce and I are really looking foreword to going again and hope the wing will be everything that I am hoping for. Gale Sherman's beautiful 1917 French Spad XIII. This is a museum quality K&W kit. 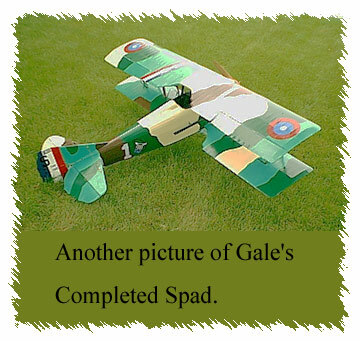 Another shot of Gales Spad. Isn't the framework a thing of beauty? It's a shame to cover it. Gale has finished his project and it looks like his colorful paint job turned out great. Here's a second view of Gales Finished plane. 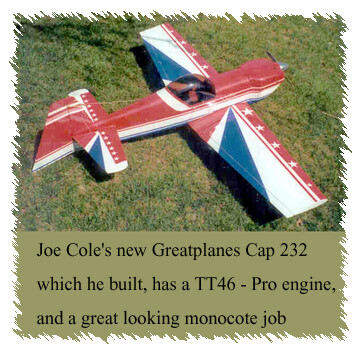 Joe Cole built this great Cap 232 last month. Keith Paskewitz is planning to build another IFO and color it like this. Keith Paskewitz Finished IFO Keith recovered his old IFO to match the new one. Gale Sherman's latest project is a Curtis JN4-D2 "Jenny" which is a Proctor kit. It has an 87" wingspan and is 55" long. 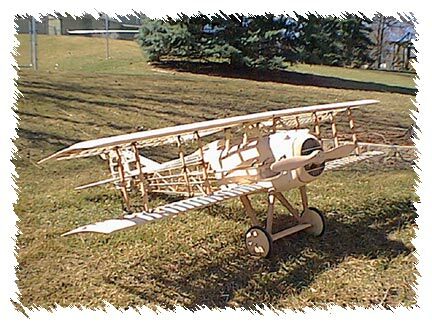 It's a very neat scale plane with all authentic scale construction, including cable controls, wing rigging and working turnbuckles. 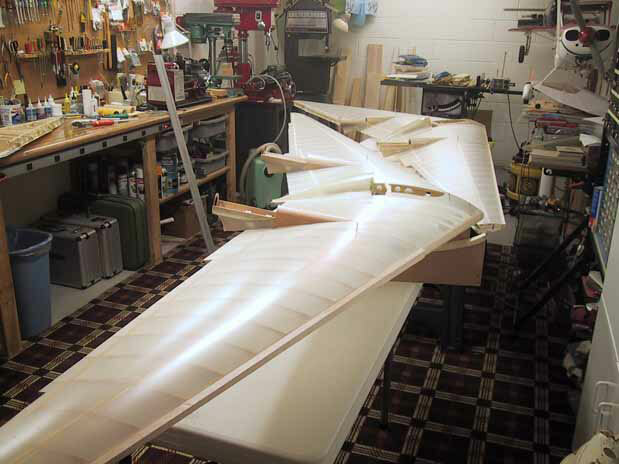 Ed Splittgerber and Gale Sherman are building two matching Martin PBM Mariners The pictures are of Ed's plane which is ready for covering with fiberglass and epoxy. 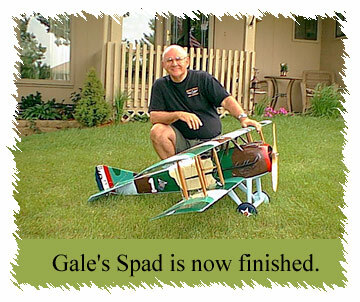 Gale's plane is also close to this stage. They plan to start fiber glassing in March after Ed returns from Texas. (These two planes are really going to ad excitement to the Float Flys this summer). 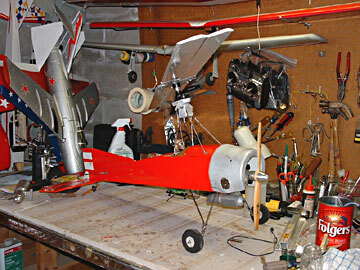 Joe Cole is building this auto gyro. Way Cool!